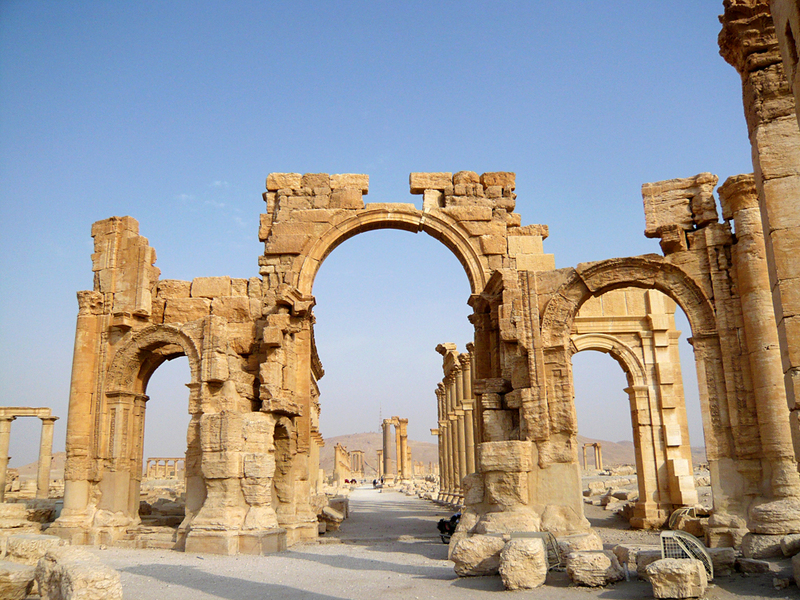 A view shows the Monumental Arch in the historical city of Palmyra, Syria, August 5, 2010. Heritage sites in Palmyra have been battered by fighting in recent years. Three of Palmyra's iconic monuments have been destroyed. Two of them – the famous Arch of Triumph with its colonnade and the Temple of Baalshamin – can be restored, however, the Temple of Bel, consecrated to the Semitic god Bel, is likely beyond repair. Alexander Sedov, the general director of the State Museum of the East, who was part of a recent Russian delegation to Syria, made this announcement on July 11. "The key findings are that the destruction is not as significant as expected," Sedov said. "The settlement itself has not suffered as much as we feared, but the iconic monuments of this ancient city, which used to be Palmyra's signature landmarks, have been destroyed. In addition, there is minor destruction in other places – the necropolis has been damaged very badly." According to Sedov, the Temple of Baalshamin was completely destroyed, having collapsed like a house of cards in the explosion. However, he maintains that its restoration is quite possible, as is the reconstruction of the Arch of Triumph. "But it will take considerable time and considerable financial costs," Sedov said. "These fragments are well-preserved, they can be disassembled, numbered and restored, quickly and not very costly, with the exception of the Temple of Bel. That work would take many decades. The burial tombs, both aboveground and underground, have been completely destroyed – they cannot be recovered." According to Sedov, the work itself would take approximately 1.5–2 years, but the situation is complicated by the lack of infrastructure in Palmyra, the troubled situation in the region, as well as the fact that it is on the UNESCO World Heritage list. Therefore the expert believes that coordination between all the concerned parties could take considerable time.